Are you planning a family vacation to Central America and want to know how to sneak in some fishing? Do you have kids who love to fish, but aren’t sure what gear you might need for the tropics? You’ve come to the right place. We rarely travel anywhere without a fishing rod. You know, just in case. Before the kids, I traveled the world, fishing rod in hand, slowly checking off a bucket list of fish to catch. Since having kids, vacations rarely revolve around fishing. However, I still manage to bring the rod and some lures and sneak off in piscatorial pursuits, even if it now means a mackerel off the beach instead of a marlin in the blue waters. Furthermore, some of my favorite catches weren’t even from a boat but right off a beach, that same idyllic beach where the kids are complaining about sand being thrown in their eyes and the wife is screaming at everyone in earshot to reapply sunscreen. 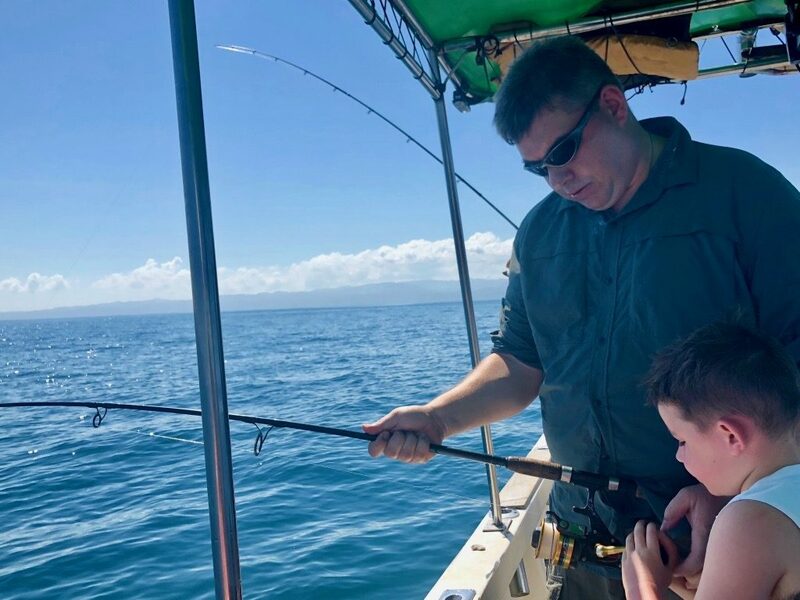 Whether you’re on a beach vacation in Mexico, a family adventure in Costa Rica or a resort in the Caribbean, if there is water nearby, there are fish to be caught. Tropical fish can be a lot more fun to catch than the backyard bluegill or the stocked trout in your local lake. Frankly, saying “a lot more fun” is like saying a Ferrari is a little peppier than a Kia. Once you’ve hooked a warm water sport fish, it’ll be hard to go back. 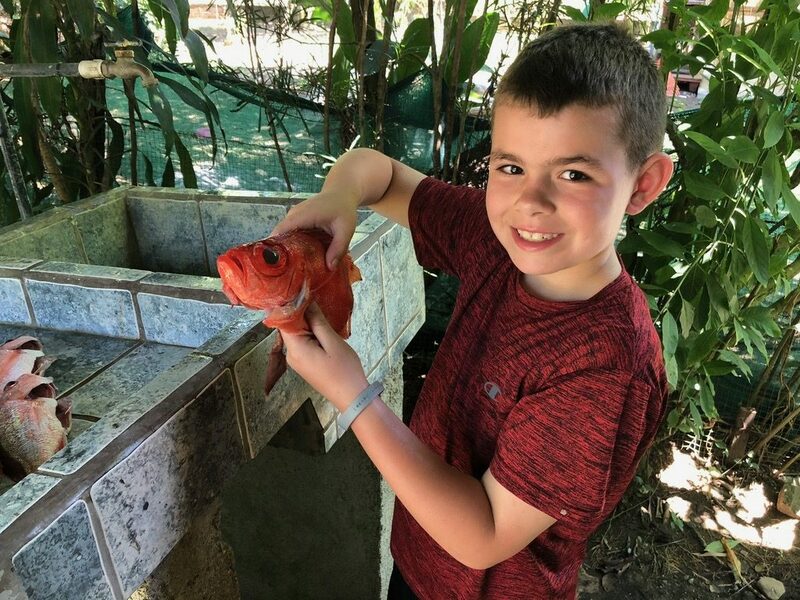 If you love to fish and your solo vacations are long past, never fear: you can take your kids fishing in Central America, and it will be a hell of a lot of fun. So pack a rod and some lures. If you are lucky, you just might hook dinner. At a minimum, you can get a few moments alone or, if the kids are old enough, watch your offspring hook the fish of a lifetime. Here are some tips from a few dozen trips south of the border. Don’t get us wrong: we love fishing the deep water, too. Rod: There are a handful of three-piece travel fishing rods that can handle this kind of fishing. You want a medium-heavy rod capable of throwing a two-ounce weight and rated for 15#-20# line. My favorite is a Lamiglas travel rod that no longer exists, but this one from St. Croix looks similar. Okuma also makes a good travel rod that’s strong enough to reel in a decent-sized fish and will still fit in an overhead compartment; I would recommend one of their shorter rods. Reel: You want a strong spinning reel that is not going to blow up on you the first time you hook into an angry jack. I like the Penn Battle II as it’s relatively affordable, tough and so far has handled everything I’ve thrown at it (including a dorado off the beach). Line: I put on 15# or 20# mono and as much as the reel will hold. Sometimes you will simply be outclassed, but tie a good knot and this makes a good set up. This combination of rod, reel and line lets you have fun with what you are likely to catch, gives you a shot at the big one and doesn’t break the bank. The next question is: what lures should you pack? After years of experience, I’m down to just a handful of items. These work well off the beach in Mexico or Costa Rica, in a quiet bay in the Caribbean, or from a kayak in the Atlantic. These are a few of our favorite lures…you don’t need any others. Krocodiles: These are heavy and flashy — speed is the key here. Cast them out and crank as fast as you can when you reel in. If it’s skipping right behind the surf, it will get the attention of a hungry predator, and look like a fleeing baitfish. The best color is silver with the blue reflective sticker. For kids, it’s a simple lure to fish, just cast and retrieve. Buzz Bombs: Developed in the Pacific Northwest for salmon, they are deadly on gamefish. Fish it like it says on the package. I’ve caught tuna in three different oceans on Buzz Bombs, as well as jacks, barracuda and dorado. If it’s a predatory gamefish, it’ll devour a Buzz Bomb. I like a yellow or pearl color in the 2.5 or 2.75-inch size. White Aerojig Marabou Jigs: You’d be shocked by how many game fish are in the surf attacking small juvenile fish. 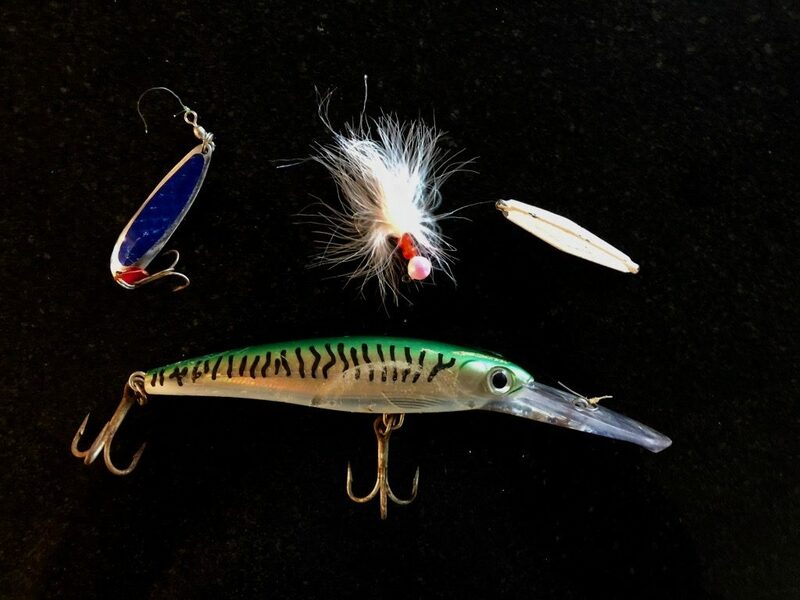 These lures seem to best imitate them and sometimes save a slow day (and if you’re fishing with the kids and you need to catch a fish, any fish, these are my go-to lure). Just throw them into the surf and jig away. You need the 1/4 or 1/2 ounce size. Rapala X-Raps: A little harder to cast, but sometimes they have been deadly; this is my favorite lure to pull behind a kayak. If you want a bigger fish, these are great, especially near a reef where big snappers lurk. The Magnum 15 in a mackerel color is my favorite, but I also like a Yo-Zuri fished in a similar fashion. Needle-nose pliers. Ever seen the teeth on a barracuda? Or a sierra mackerel? Or a good-sized pargo? Or my wife when I’ve been fishing a little longer than I promised? Bring the pliers. You’ll need them to get the hook out of those sharp mouths. I always bring a few fingernail clippers to cut line. Sometimes I put on a wire leader if mackerel or barracuda are overly present. I’ll also bring a few live bait hooks and weights just in case I get my hands on bait—but again, how long are you going to be able to fish? If it’s likely only a handful of casts till the kids get bored, well then, throw out that lure as many times as you can get away with. Finally, Ziplock bags are a must, because I always seem to get wet fishing. Use them to keep phones and wallets dry. Predatory game fish can be anywhere, but there are places they like to congregate—points, near river mouths, by rocks, places where they can find food. Look for jumping bait, birds, or the best bet: where the locals are fishing. On the typical sandy Pacific Coast beach, I’ll walk up and down the beach looking for fish just behind the breakers. In the Caribbean, in quieter, deeper waters, I’ve had luck in channels between islands or drop-offs near marina mouths. Kayak rentals are getting more popular and will definitely give you an opportunity to find fishy water. My favorite in a kayak is trolling a Rapala or Krocodile 50-100 feet behind me. Since most rental kayaks do not have rod holders, I’ll set the drag really loose and try to hold it in place with my legs. Drop-offs and reefs are optimal places. Double kayaks are great for letting one person fish and another paddle. Fresh snapper can bring a smile to anyone’s face. There’s a favorite beach of mine in Costa Rica, and I bet over the years I have caught 15 different kinds of fish there. I’ve probably caught another 15 species off beaches in Mexico, Belize, Honduras, and Panama, among others. Big fish are smart and usually need live bait to be enticed to bite, but I’ve hooked jacks, snappers, roosterfish, tarpon, bonefish, and even a baby manta ray by mistake. If you scale down (smaller lures), you will likely catch more, smaller fish, which will keep the kids entertained. Ladyfish might annoy most anglers, but when they fight and jump out of the water a half dozen times, it’s likely to entertain the little ones. The best advice I can give you for taking your child on his/her first fishing adventure is to gear down. 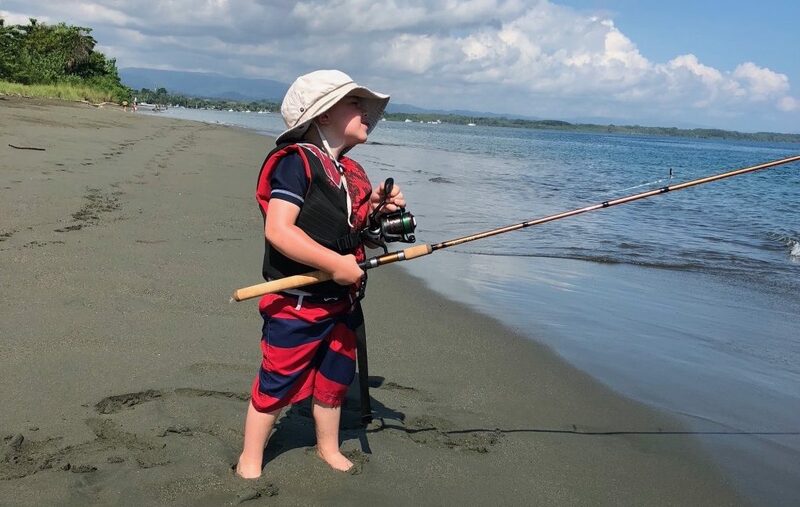 If you use smaller lures like jigs or Krocodiles, you will catch the right sized fish—fish that aren’t too strong for your little one to reel in. Look for estuaries, docks, and calmer waters where small fish might congregate. Don’t waste your money on a kid-specific fishing rod setup, though; that’s for the bluegill pond back home. Those reels are generally poorly made and will break with the first toothy critter that takes you for an easy meal. You really don’t have to worry about sharks; they only come into the shallows at night. However, be smart around river mouths in Central America as they are the favorite haunt of bull sharks. Stingrays are out there, but a simple shuffling of the feet avoids most of them as they would rather run away than impale you. If you do step on one, just think: you’d much rather have your kids learn all sorts of new swear words from you rather than some kid on the playground, right? And if you hook a mermaid? Well, apologize and lay off the tequila.